Now That’s Zany, Vol. 2! Zany Golf isn’t the first video game based on miniature golf, but it may as well be. The sub-sub-genre’s actual forerunner was Miniature Golf for the 2600, and it’s about as blocky and boxy and “gotta use your imagination-y” as you’d expect. Zany Golf actually has courses with multiple areas, terrible carnival music, and interactive objects like a bouncing hamburger and walls that lower up and down. Sounds like childhood to me too, but unfortunately the game’s nostalgic look and sound are undermined by overly sensitive mechanics. Fun-gineers tested this windmill’s wackiness, and it’s 2%, far below the legal limit. Zany Golf kicks off with “Wacky Windmill,” a hole that does indeed feature a windmill and looks remarkably similar to some of the quaint minigolf courses that I played as a child. From here on, though, things get ridiculous. “Hamburger Hole” features the aforementioned hamburger that bounces joyously above the hole (press ‘A’ repeatedly to get the hamburger bouncing really high, otherwise it’ll just sit there and leak secret sauce into the hole). “Pinball” traps you in a limited pinball machine that won’t let you out onto the course unless you hit certain targets. “Knockout Nightmare” puts you in a Breakout-like game, where you have to hit all targets before the path to the hole is revealed. Zany, maybe, but golf? Hardly. This hole isn’t that tough, but it is disgusting. The more outlandish the courses become, the more precise you have to be with your shots. To hit the ball you hold ‘A,’ then pull the cursor behind the ball with the D-pad and release ‘A’ in the direction you want the ball to go. It’s simple, but you have to make sure your cursor is lined up exactly behind your ball in the proper direction; one slip-up is all it takes for you to go off course and ruin your entire game. Once you’re sure of your shot, consider the ball speed. Pulling the cursor too far behind the ball will make it sail across the course and more than likely miss the hole. The ¾ overhead view doesn’t help matters either. I’ve assumed several times that I’ve lined up my shot correctly only to hit the corner of a wall that I was sure I’d clear. I predict it’ll take many a stroke to get out of this corner. The game only features 9 courses, which doesn’t sound like very many until you try to play them. I had a difficult time getting through the first four courses on beginner difficulty, let alone the latter half. You’re provided an allotted number of strokes, depending on the difficulty you choose. If you get par or under par on the hole, more strokes will be added to your total. If you use all your provided strokes before you finish the 9 courses, the game’s over. This pinball machine is brought to you by NBC circa 1974. 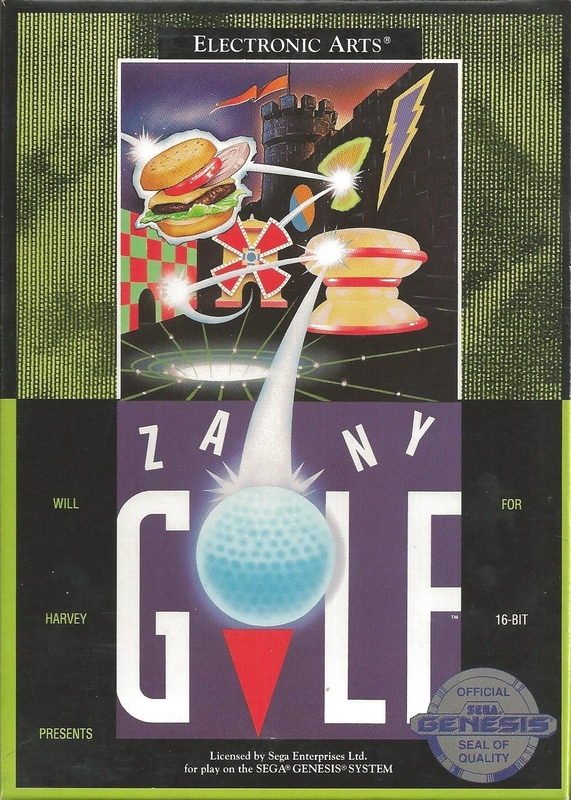 Zany Golf was originally developed for the Apple IIGS and ported to computers like the Atari ST and the Amiga in 1988 before it appeared on the Genesis in 1990. Computer games being ported to consoles is nothing new, but prior to mouse support for consoles, some of these ports wound up playing pretty rough and Zany Golf is no exception. In fact, one of the computer version’s levels, “Magic Carpet,” was cut from the Genesis port because it was presumably too difficult to control without a mouse. Imagine a mini-golf course where the designer had an unlimited budget and a lack of common sense, and that’s pretty much Zany Golf. You can’t help but appreciate the bizarre course design, even as your tired adult self cries out for a bit of restraint. Unfortunately, it’s this ambition that drives the game into bogey territory. In the later courses especially, it’s just too easy to hit your ball incorrectly one time and screw yourself into a game over. After a few rounds of this nonsense, you’ll be crying out for a mouse that can account for the game’s touchy mechanics. Zany Golf can be won with time and tear-soaked cheeks, but you’re better off catching zany fever on a different platform. Spot on review. The initial level or so are good and it feels like crazy Golf. Then it just gets silly and the game moves away from being fun. If they had just left it as a Crazy Golf game then it may have been a much better game. Yeah, I was really hoping for a more traditional minigolf experience. Oh my! I completely forgot about this game. I always thought it was a lot of fun. In fact most miniature golf games I have found recently do not touch this game. Of course it has been decades since I played this game as kid, so maybe time has warped my memory. Can’t wait to play it now!